Jordan Nassar creates intricate, painting-like embroideries that mix traditional stitching with a modern approach, color scheme or subject-matter – or all of them. The Arab Apocalypse. Jordan Nassar. Untitled (8 Pointed Stars). Jordan Nassar. For more, visit Nassar’s web page or follow him on Instagram. Country Living magazine June 2017, p. 27. 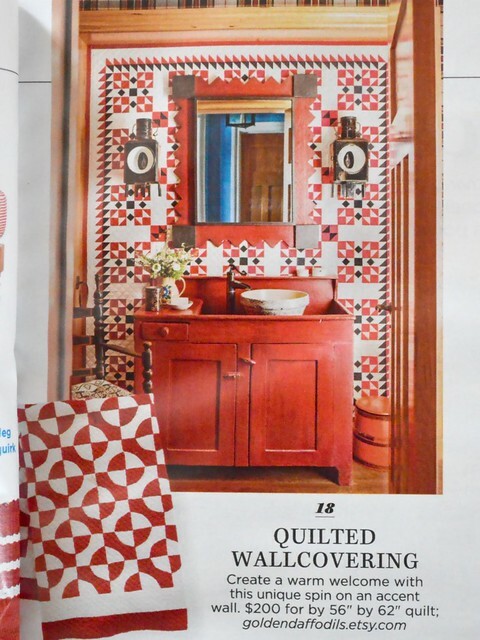 It seems to be from a bathroom or a half bath with a red wooden dresser repurposed as a vanity, plus a red and dark brown wood-frame mirror set against a coordinating red, black and white quilt. By all appearances, the quilt is permanently attached to the wall. Wow, what a wonderful look. The mirror on top of the pieced multicolor quilt is too busy for my taste, but I really like how striking the wall is and how well the space is pulled together. A comparable look would be relatively easy to achieve with paint and a stencil, if you don’t want to use a quilt or are worried about the longevity of textiles as a wallcovering. Lisa Tilse at We Are Scout. So clever! The blue and green Earth is the best, closely followed by Saturn with its rings and the colorful Jupiter. Visit her site for the tutorial. 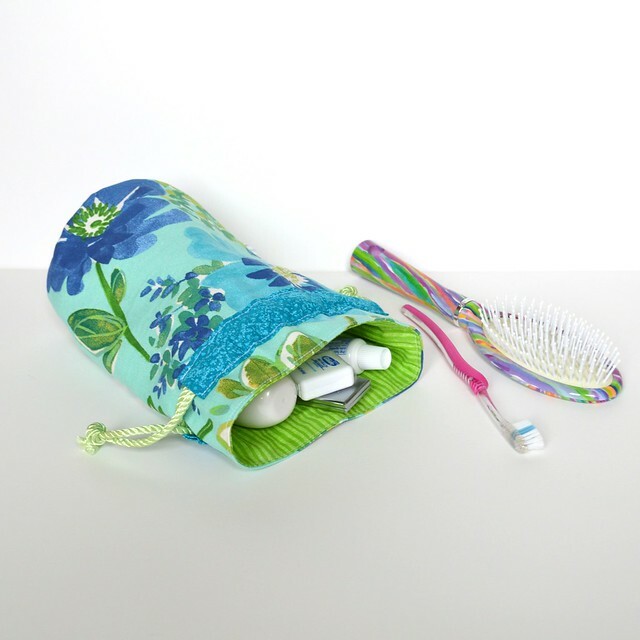 I listed a few canvas pouches at the Playfully Grownup Home Etsy shop. They’re made from a variety of prints and solids. I used up remnant canvas pieces to make them. The light green one has a really great, understated but elegant floral pattern outlined in white. 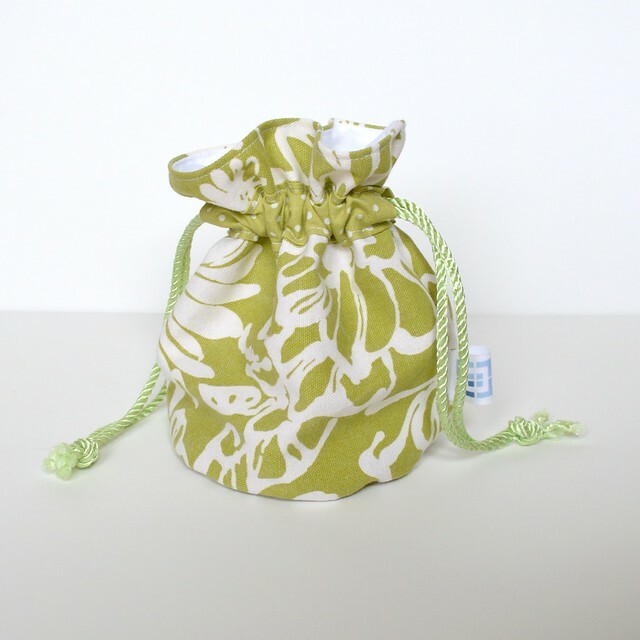 I added a coordinating green and white polka dot accent for the drawstring channel. …and the second a solid bright blue cotton. The latter makes a nice, strong contrast. 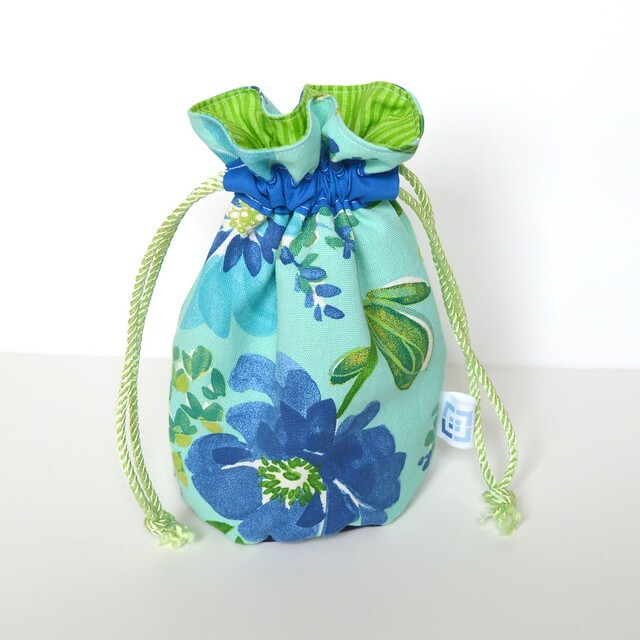 Both colorways have a round bottom made from solid-colored canvas – pale mustard for the green and navy blue for the blue and turquoise bags. Find them in the Playfully Grownup Home > Carry Me section. And as always, if you have any questions please don’t hesitate to ask! Oh, wow, I love the colorful, geometric quilt patterns by Elizabeth Hartman. Elizabeth Hartman / Oh, Fransson; collage by Eppu Jensen. Elizabeth Hartman / Oh, Fransson. Did you find a favorite? Ms. Jenn Makes on Instagram; photo by Angela (wanderings_in_wonderland). Ms. Jenn Makes on Instagram. Absolutely breathtaking! Jenn mentions using a beading technique called tambour beading, which I hadn’t heard of before. I just love learning new things from my fellow textile geeks! Visit Jenn’s Instagram for more views and details or the Ms. Makes website for more sewing talk and tips. Reminder: the just-because-spring-is-here sale 2018 is still on, but for a limited time! This is your last weekend to enjoy 10% off everything at Playfully Grownup Home on Etsy – the sale ends on Monday, April 30, 2018. This sale is as shopper-friendly as I can make it: no minimum orders, limits, codes or coupons are needed. My Etsy shop is open throughout the weekend; Saturday and Sunday orders will ship on Mondays. Last Weekend to Bid in the Con or Bust 2018 Auction! Reminder: this is your last weekend to bid in the Con or Bust 2018 auction! Bidding ends this Sunday, April 22, 2018, at 4 p.m. EST. 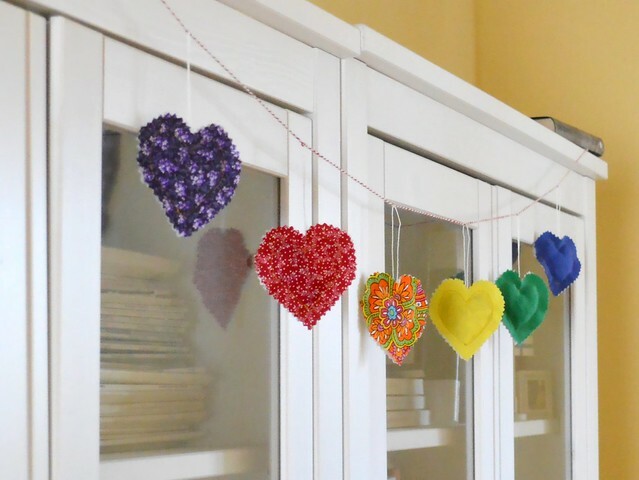 I made this rainbow heart banner specifically for the auction. My Internet feeds seem lately to be serving me with foxes left and right. Inspired by this serendipity, here’s a short roundup of soft fox crafts. LOVE the fox with glasses! Jaana offers no tutorial, but there’s a second photo in her blog post that shows the fox sleeves spread out for additional details (NB. in Finnish only, and you have to scroll quite far to get to the foxes). Looks so comforting, too, besides being full of awesome. Finally, cute and awesome crochet pattern for fox slipper-socks – complete with a white tail tip!